This space has a mixed lighting situation. Overhead is a dropped ceiling with a row of white fluorescents which are always on. Meanwhile, facing the art wall, eleven very large west-facing windows span the entire 128 foot length of the space. Windows have blinds that, if lowered, diffuse but not block the natural light. During full daylight, whether overcast or sunny, the shadow pattern inside the square created by the square is barely if at all visible. 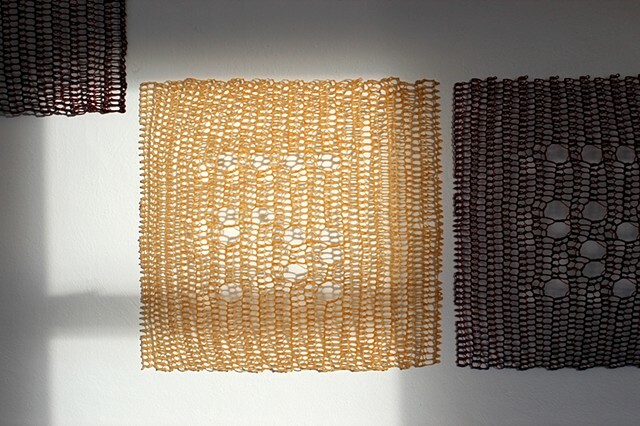 As the late afternoon sun begins to drop, focused harsh light hits individual squares directly in its path and creates a kind of photogram on the wall. Sometimes the shadow drawing is direct, in focus, and assertive.